This is the arrangement of order of the phones in the test. A to C from left to right. In some cases Phone C's photos were too soft (whatever the phone is) yet,it had way too many votes just cause its photos were brighter!!! LG G6 Win, 2nd XZP, 3rd S8. AnonD-77443, 18 May 2017Nope, B is the 2017 Sony XZP. 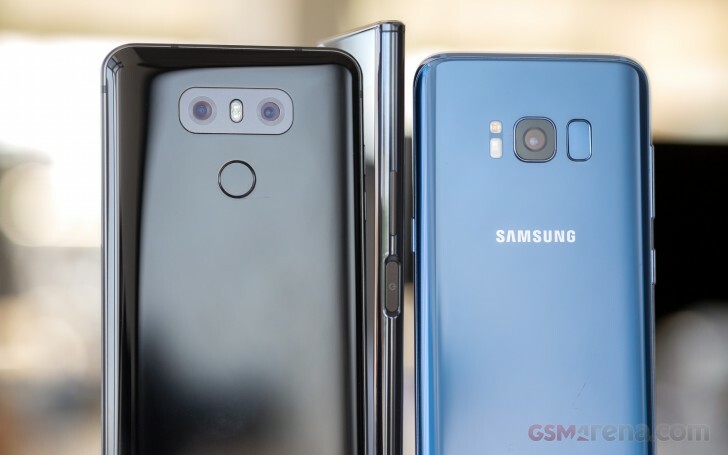 The link below shows the XZP against the G6 and S8 in a low l... moreDo the same exercise but change from Sony XZ Premium to Moto G4 Plus and look at the watermark next to mr Darwin on the £10 bill. Why is Moto G4 Plus the only camera that captures the watermark? Both in good light and low light, it is the same. So, are the photo comparison as accurate as we would like it to be? Fine. I'm a Sony fanboy, but I want to be honest here. Can we just have our own choices? It's not like we're not free to have our own opinions. AnonD-77443, 18 May 2017And how does that change things?? The image quality of Phone B (obviously the XZP) is shocking... moreA = XZP, B = LG, C = S8. Clearly. There's no way on God's Green Earth that a 19MP produces detail levels that low Vs 12mp shooters in daylight. A has all the processing hallmarks of the Sony. Why test a phone that is not in retail still? Sony themselves said that retail unit will have an updated camera software to further improve what we have already. I ain't saying XZ Premium retail unit will blow the two away, but it's far more fair to compare the official ones than the pre-production ones. And btw, I'll give vote to the S8, but I'll give my respect to B, which I suspect is the XZ Premium. Got the smallest aperture, smallest pixel size, and no OIS, yet still manages to get some impossible results that doesn't really blow anything away, but isn't the worst. And I'm laughing at that guy who said the Note 4 will beat the XZ Premium. XD. Xperia Z5 series already blows the Note 4's camera away, and comparing to the XZ is just nothing of a question, and the XZ itself is not even comparable to the XZs/XZ Premium. Still waiting for DxOmark's test and will provide us fantastic low light results from the XZ Premium. ithehappy, 18 May 2017I don't care which one is best but I simply wanna confirm whether #B is XZP or not. And then I... moreIt's clearly not phone B and if you'd ever used a Sony before you'd recognised it's algorythm. B is the LG. AnonD-524937, 18 May 2017It seems like pic 3 and 4 for B aren't legit.It is probably isn't in focus and it is a mess. ... moreNope, B is the 2017 Sony XZP. The link below shows the XZP against the G6 and S8 in a low light (28 lux) studio... its terrible. I don't care which one is best but I simply wanna confirm whether #B is XZP or not. And then I wanna laugh some more, though not much laughter left after reading the phone's review anyway. It seems like pic 3 and 4 for B aren't legit.It is probably isn't in focus and it is a mess. It is impossible for a 2017 flagship camera to be that horrible!